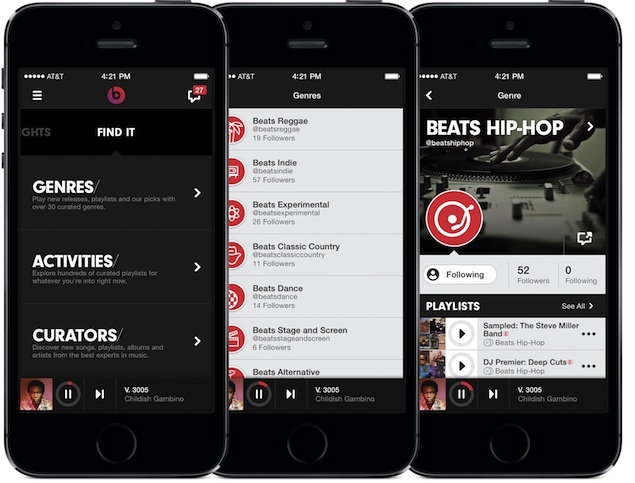 Beats, one of the most successful and popular headphone companies are now becoming a rival to Spotify and other similar companies as they launch a brand new music streaming service Beats Music. This wildly anticipated service already includes over 20 million songs, an offline storage for your favorite songs and a 'Just For You' page which recommends similar or brand new songs to customers. More importantly it also includes a 'Find It' Feature allowing you to find a created playlist of your liking based on genre and your previous activity and a share feature allowing you to share the songs you love over Beats Music, Twitter and Facebook. The service will be available on the iTunes App Store, Google Play and Windows for free however there is a subscription fee which will cost you $9.99 a month, once you sign up the service will be free for 7 days allowing users to try the brand new experience. Example of the service on an iPhone 5s. As you can see from the photo the apps interface looks very clean and sleek, it gives you tabs including genres and activities which is a new section allowing you to pick a created playlist that's perfect for what you're doing, such as jogging or lifting weights. Now the question on many peoples lips is whether this will rival Spotify now that they are adding a merchandise shop and allowing the service to be free on phones and tablets. However it's so far so good for the new streaming service as it becomes available for the very first time, hitting the charts within various different stations including the App Store and Google Play. The UK will have to wait a few weeks however, But hold on tight.